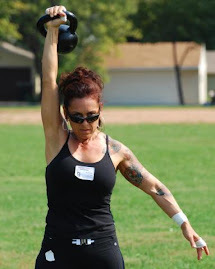 Tracy Reifkind's Blog Living My Physical Potential: Monday Max V02 9 reps per 15 sec. 1 min on. 1 min. rest, misc. swings and snatches w/12kg, x 3 = 6 min. I felt good and rested (from snatches!) and didn't have any problems with this workout. I increased my reps per 15 sec from 8 to 9 and it seems to be the perfect pace, decreasing the rest period by a couple of seconds, using up the full 15 sec., keeping my heart rate higher. I remembered the first time I snatched 9 reps per 15 sec., last year, and I thought you might enjoy seeing the difference in my conditioning. Your words, workouts, and views are inspiring. The thing I love the most though is "Powertrip" always playing in the background! Holy Crap Tracy! Nice work! It'll be interesting to see how the 16kg feels next week after doing 9's. I hope the day of the 14kg (30lb) kettlebell is coming soon. For me, I think it could benefit my training.